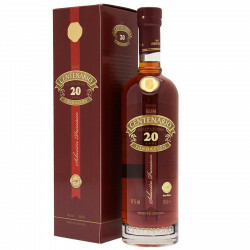 Centenario 20 years old Solera Fundación is a premium rum produced by the distillery located in Costa Rica. It brilliantly mixes the fruity notes of a young rum with woody and spicy notes of older rums. A small tropical country located between two oceans, Costa Rica enjoys a warm and humid climate, favorable to the cultivation of sugar cane. Centenario rums are made with a sugar cane that has the particularity of growing on volcanic soil. Centenario 20 years old Solera Fundación rum is one of the premium rums of the distillery, aged using the solera method in American oak barrels. The solera aging technique consists in aging the rum in cascaded casks in which rums of different ages are added. This expression is rich with gourmet aromas, almost like pastries. It balances harmoniously between the fruit notes of the young rums and the woody, caramelized and spicy notes of the older rums. Fanal produces the Cacique Guaro, a typical alcohol from Costa Rica, derived from cane sugar and considered as a variety of sweet rum (about 30% of alcohol). Since 1985, Fanal develop and sell the Centenario, opposite to the Cacique Guaro, is destinated to the exportation. The molasses is produced locally, from two varieties of sugar cane called castilla and criolla. The distillation is carried out using two types of stills, in columns and continuously, for light distillates with a grading of 96% and pot stills for eau-de-vie more complex spirits with 80%. Result of a long and patient process of elaboration, the rum can be aged according to the Solera, spanish method, in order to standardize the aging of the rum. More the Solera has levels, this overflowing filling from the top floor, more the older the spirits are drawn. Colour: Amber coloured with mahogany sheens. Nose: Complex and smooth with very ripe fruit notes like cherry, pineapple, apple. Like a pastry, with hints of spices (cinnamon) and wood. Palate: Soft and creamy, full of vanilla and orange peel at first, and then notes of dark chocolate, tobacco, leather and toffee. Finish: Long and tasty, marked by spicy flavours with hints of ripe fruits and butter.